Images and videos courtesy of Def Jam, G4TV, and Youtube. Hmmm… could Hip-hop music become a good addition to a party game? Of course. Rock Band DLC has attempted to implement this genre recently by adding some Snoop Dog tracks to the Rock Band mix but it does not feel the same because Rock band is well, Rock band. Enter Def Jam Superstar. 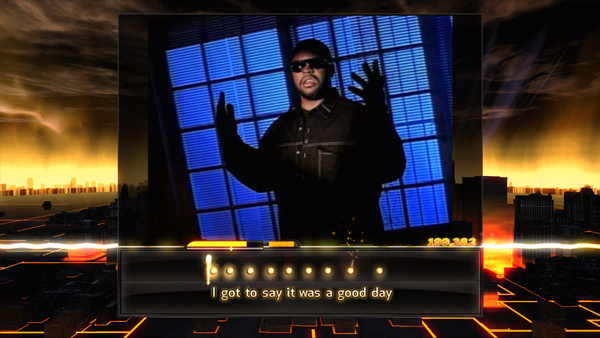 Basics of the game; the original video of whatever track your spitting to plays on the screen, the words scroll across the TV for the player to rap to, and the player has the option of seeing yourself perform with the PSEye or Xbox camera depending on which system you use. You also can save a copy of your performance and upload it. The track list is abundant with old school, East/West coast hip-hop, Southern, and newer tracks. Downloadable tracks are also available as well as a freestyle feature where players can freestyle over included beats. Vocals of the original tracks can also be removed so that the players voice is only heard. This is the same feature that is available in Rock Band. The largest complaint I have heard about the game is that the tracks are edited and kill some of the songs. As with most hip-hop, F bombs and such are abundant but are cut out of the songs in this game. Come on developers, no censored on/off option? If you are a hip-hop lover and like to play Rock Band consider giving Def Jam Rap Star a go and make it an addition to your Party.